Celebrity Cruises kicked off its “Celebrity’s World Tour 2014-15.” The collection of itineraries will be revealed in detail as each set opens for bookings over the next four weeks. The destinations the brand will offer covers each of the seven continents, with more ports of call and more overnight stays. Africa: Celebrity Silhouette’s 14-night Holy Land voyage will depart roundtrip from Rome (Civitavecchia), and will be highlighted by an overnight stay in Alexandria, Egypt; an overnight stay in Jerusalem (Ashdod), Israel; and visits to Haifa, Israel; Ephesus (Kusadasi), Turkey; Athens (Piraeus), Greece; Catania, Sicily, Italy, and Naples/Capri, Italy. Antarctica: Fourteen-night voyages on Celebrity Infinity depart from Buenos Aires, with visits to Ushuaia and Puerto Madryn, Argentina; Cape Horn, Chile; Schollart Channel and Dalhan Bay, Paradise Bay, Gerlache Strait and Elephant Island, Antarctica; Port Stanley, Falkland Islands and Montevideo, Uruguay. Australia: Celebrity Solstice will present 12-night Australia & New Zealand vacations beginning with an overnight stay in Sydney, followed by visits to Melbourne, Australia; Milford Sound, Doubtful Sound, Dusky Sound, Dunedin, Akaroa, Wellington, Tauranga and Auckland, New Zealand. Europe: An 11-night Mediterranean vacation is available aboard the newest ship in the Celebrity fleet, Celebrity Reflection, departing roundtrip from Rome (Civitavecchia), Italy, with visits to Santorini, Mykonos and Athens (Piraeus), Greece, along with Naples/Capri, Italy, Ephesus (Kusadasi), Turkey, and an overnight stay in Istanbul, Turkey. North America: Celebrity Solstice will bring Solstice Class style back to Alaska on seven-night sailings roundtrip from Seattle, Wash., with visits to Ketchikan, Tracy Arm Fjord, Juneau, Skagway, the Inside Passage of Alaska and Victoria, British Columbia. 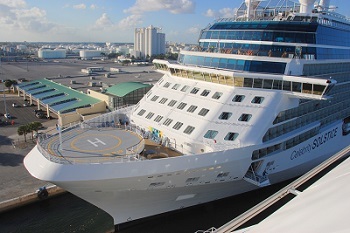 South America: An overnight stay in Buenos Aires begins a 14-night voyage on Celebrity Infinity, followed by visits to Montevideo and Punta Del Este, Uruguay; Puerto Madryn and Ushuaia, Argentina; Cape Horn, Punta Arenas, and Puerto Montt, Chile, in addition to sailing through the Straits of Magellan and Chilean Fjords, ending in Valparaiso, Chile.